Some of the most sought-after bourbons come out this time of year, including Pappy Van Winkle, Buffalo Trace Antique Collection, Parker’s Heritage, Old Forester Birthday Bourbon, and Four Roses Small Batch Barrel Strength. Since 2012, you can add the Angel’s Envy Cask Strength to that list. 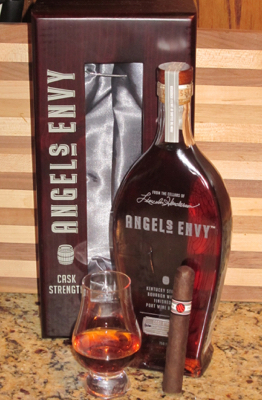 The 2016 Angel’s Envy release is 124.6-proof, or 62.3% ABV, slightly lower than last year’s release which was 127.9-proof. Just 8,000 bottles are being produced this year, up from 7,500 in 2015. The bourbon pours a copper color and features an intense but inviting nose with ginger, pear, black pepper, sugar cookies, and some pure alcohol heat. On the plate, there is a full-bodied combination of figs, butterscotch, red apples, oak, and the notable influence of the port barrels in which this bourbon is finished. The finish is long and spicy with wood and port. This is an intense, almost overpowering bourbon when sipped neat, but just the smallest amount of water smooths the rough edges and opens up a cacophony of more subtle flavors. Last year, after trying the sample I received from Angel’s Envy, I went out and purchased a full bottle (the bottle in the picture). Although the price is high, this tasty cask-strength bourbon has me considering doing so again. Pair this bourbon with a bold, spicy smoke. Here are a few suggestions: Arturo Fuente Opus X, Tatuaje Havana VI Verocu, Paul Garmirian 25th Anniversary, and Joya de Nicaragua Antaño.